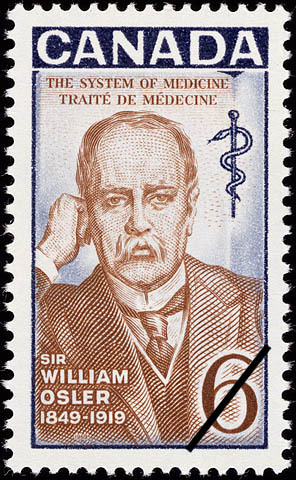 The value of a Sir William Osler, 1849-1919, The System of Medicine - 6 cents 1969 stamp depends on several factors such as quality and wear, supply and demand, rarity, finish and more. Values in the section are based on the market, trends, auctions and recognized books, publications and catalogs. This section also includes information on errors and varieties and characteristics. Sir William Osler, whose dedication to the science of medicine led to recognition as a world medical figure and one of the finest diagnosticians of his day, is commemorated on the 50th anniversary of the year in which he died. The youngest son of a pioneer missionary, William Osler was born in the small community of Bond Head, Ontario, on July 12, 1849; it has been said that his childhood environmental exposure to religion, the classics and human values eventually, in his teaching career, endowed him with a style of communicating rated as probably the most understandable of any physician. From Trinity College, Toronto, where he had enrolled in 1867 with a short-lived purpose of entering the ministry, he transferred to the Toronto Medical School; later he studied medicine at Montreal's McGill University where he took his M.D. in 1872. His graduation was followed by a realization that greater knowledge was to be acquired by the study of advanced medical practices in Europe consequently he journeyed to London, thence on to Berlin and Vienna. Returning to his native land in 1874 he established himself in private medical practice for a short period at Dundas, Ontario; an offer of an appointment as lecturer on physiology and pathology at McGill was promptly accepted and, in the following year, at the age of 25, he was named a full professor at the same institution. Dr. Osler's medical teaching career continued at the University of Pennsylvania, Philadelphia, where he served from 1884 to 1889; Johns Hopkins, Baltimore, 1889-1904, and Oxford University in England, 1904-1919. The story goes that Osler throughout his long medical career, was fond of pointing out the initial entry in his private practice account book: Speck in Cornea .....50 cents. In his teachings Dr. Osler believed that lectures alone were not enough consequently he originated his famous bedside clinics, a revolutionary method of teaching; it was perhaps here that his philosophy of human kindness had its greatest expression. He was an ardent advocate of vaccination and anti-typhoid innoculation, which, with respiratory diseases, were his special interest. Despite any particular interests, however, it is recognized there were few medical areas where he did not personally investigate and make significant contributions. The heritage left by this great physician is more than a memory; his medical writings were numerous and varied, one, and perhaps the best known, was assembled from his copious notes and first published in New York in 1892 under the title Principles and Practice of Medicine. 16 editions of this work have been published with translations into French, German, Spanish and Chinese. His extensive library of medical and rare books was bequeathed to McGill University where it is housed in a special section. An ironic fate provided that Sir William Osler, created a baronet in 1911, was to succomb to pneumonia, the symptoms of which he readily recognized as those against which he had battled on behalf of others for so many years. His terminal illness overtook him in the October prior to his death on December 29, 1919.